Double the kids, double the trouble. Getting just the right double stroller for your kids is much harder than picking a single one. It’s not easy to find a double stroller that has all the features you need, one that is robust and safe while not weighing a ton. The latter is important, as you will be strolling almost every single day. 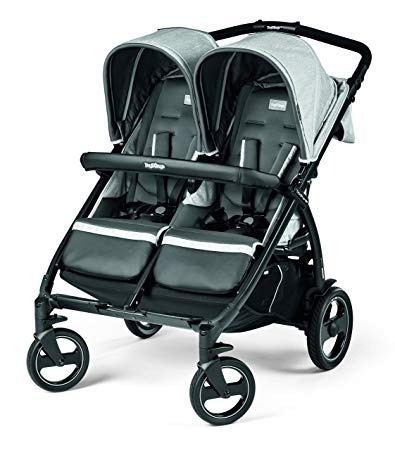 No matter if you have two toddlers of different age or twins, I’ll do my best to make the choice easier by reviewing the best double strollers available today. Sit-And-Stand Strollers – Are They Right For You? 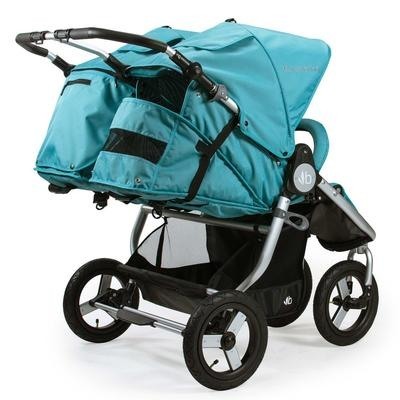 Baby Jogger has done excellently well with this side-by-side stroller, and although it is a bit more expensive, it offers more features when compared to the traditional City Mini Double. You can have two infants in the two regular seats, each of about 3-6 months old and a weight of 50lbs each. Both riders can hold their heads up. Your little passengers get maximum ventilation through the vents, which can be covered with the fit-in retractable covers. These seats can be set to a near-flat position, all thanks to the multi-position recline. Still talking about the seats, there is a small, customizable footrest for your kids, as well as generous padding of the entire seat and calf rests. If both babies end up taking a nap at the same time, the space between the seats ensures that both sleep without disturbance throughout the stroll. To keep your little passengers away from the harsh weather, the manufacturers have included a 3-paneled canopy for each seat. These canopies come with two peek-a-boo windows each, giving you access to your kids anytime during the journey. The front wheel suspension system ensures that the ride is as smooth as possible, by neutralizing all the effects of the bumps. Its 8.5” rubberized tires are meant to handle all terrains. So, you can take this stroller on gravel and somewhat uneven surfaces. If you are wondering if this stroller can also serve as a travel system, it can. Interestingly, you can still have both kids in the travel system – each in the infant car seat and toddler seat, or each on two regular infant seats. It all depends on the age of your little passengers. The storage basket found under the seats are considerably big, but the bar in the middle will prevent you from reaching them easily. You can keep your large diaper bag in these things, although it requires a bit of effort. If you want to have your essentials close to you, the storage pockets found on the back of each seat are for you. This stroller is right for all parents, irrespective of the height. You will find the toggle simple and effective, as well as the hand-operated parking brake. Now, let’s take a look at the folding. The patented technology in this stroller makes folding simple, even with a single hand. 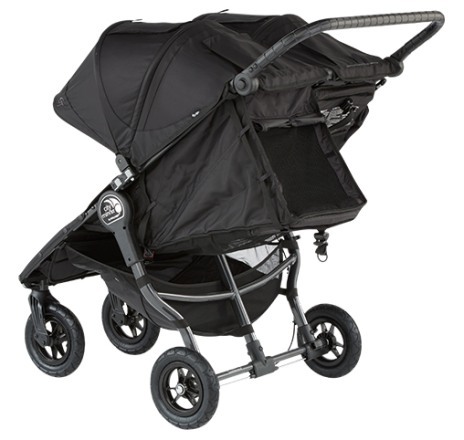 Once folded, activate the automatic lock to secure the stroller during storage and transport. You will need to clear a significant amount of space for this double stroller. But when folded, it should fit into your car trunk easily. The weight is about 32.6lbs and folded dimensions, 30.12 x 30.12 x 11.2 inches. As said earlier, this stroller is a bit pricey, and keep in mind that the various colors come at different prices. This stroller boasts of several positive reviews on Amazon, and from the analysis of this review, we have come up with the strengths and weaknesses as shown below. 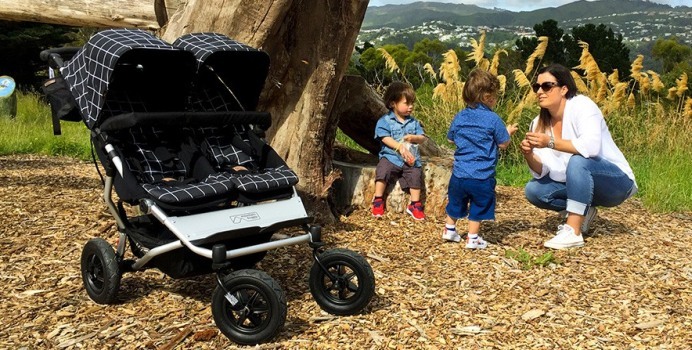 While the type of wheels and the suspension make this stroller ideal for all terrains, it struggles on very rough terrain, and you can expect your kids to bounce when strolling on rocky surfaces. Just like the popular Britax single stroller, there are excellent features packed in the Britax B-Agile Double Stroller also. However, the latter can conveniently take two kids or twins. Even with the dual seats, the stroller can still pass through tight doors and passages. Both seats have a combined carrying capacity of 100 lbs (50 pounds each). You can adjust the backrests on each seat, and recline them separately until they are almost flat. So, you can put even a newborn on the seat without issues. The depth of each of these seats is 9.5 inches, and width 11.25. Your little passengers are guaranteed of maximum comfort, all thanks to the soft and washable cloth fabric covering the seats. 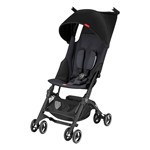 This stroller is compatible with a Britax infant car seat. However, you can only fit one car seat at once. If your car seat is not from Britax, you will need an adapter. Each of these seats has a large storage basket under them, both of which are easily accessible. Your essentials and valuables are safe in the zip-up back pockets. If you ever need the trays, they can be bought separately on Amazon, alongside the cup-holders. Your little passengers will enjoy 100% protection from the weather all thanks to the massive canopy packed in the B-Agile double stroller. Although there is no rain cover, you can easily pull the canopy down very well to keep your kids covered, and the water resistance feature ensures that the water does not get into the stroller. There is a window where you can check on your babies while on the go. Let’s talk about folding – the fast folding system gives you a fairly flat folded stroller that you can conveniently keep in your car trunk. At 30.5 x 13 x 30.5 inches, you will not need too much space to house the stroller once folded. Even when folded, this stroller still stands seamlessly. The plastic wheels are strong and come fitted with an all-wheel suspension that makes it suitable for cement, roads, and a couple of rough surfaces. There is a single step lock to secure the rear wheels, thus helping you maneuver the stroller more easily. The stroller handle is adjustable, up to 41.4”, thus every parent can easily push the stroller, irrespective of their height. You get all you pay for in the Britax B-agile double stroller, notably its compactness, the adjustable handles, and big storage baskets. However, you will need to buy the child trays separately, except you won’t be needing them. 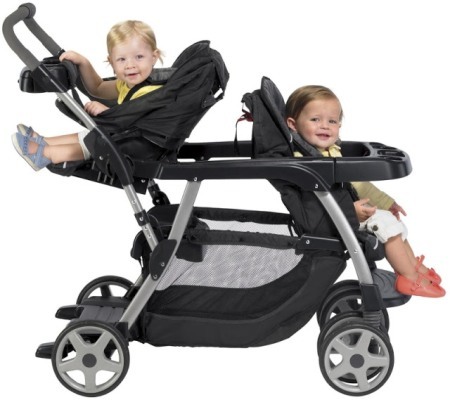 Here is one double stroller with amazing features and still available at a pocket-friendly rate. The Joovy Scooter X2 Double Stroller is ideal for infants of age 3 and older, so far they do not weigh more than 45 lbs. The adjustable seatbacks and calf rests are designed to offer your little passengers with the best of comfort. 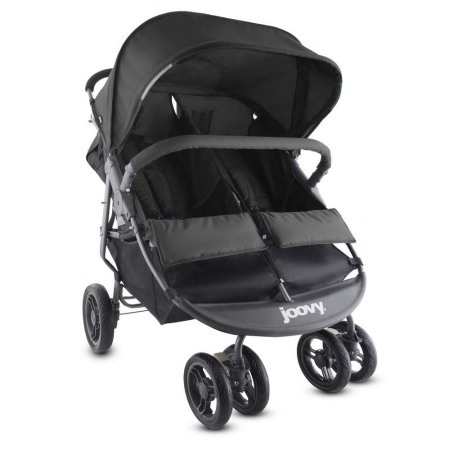 Joovy has really done well with this stroller; another notable feature is the one-hand recline that makes strolling effortless when in the grocery store. If your babies ever fall asleep, you can set the seats to go almost totally flat, all thanks to the recline feature. There are also bumper bars, which you can detach if you ever feel like. This stroller is great, but not all perfect. Let’s start with the combined canopy, which is not too suitable for kids of different ages. Yes, the canopy is big, but it could be bigger, especially when you consider that it doesn’t drop really down, thus requiring you to make other plans on keeping your little passengers 100% safe from the weather. The tall parents will most likely struggle with the non-adjustable handlebar that extends to 42 inches in height. This also means that parents who are not entirely familiar and experienced with strollers will find it difficult to maneuver their ways around tight corners and jam-packed areas. The wheels are commendable – although small, the 9.5” and 7” back and front wheels sports rubber designs. This ensures that the stroller remains stable and firm on surfaces. You can also lock the front wheels in multiple positions, based on which terrain you are riding on. The single-step parking brake is also another plus. There are bearings in the wheels that improve steering and movement, so you should be able to move on different terrains, considering the presence of a durable suspension system to offer stability across gravel or dirt paths as well as on road trips. The stroller will most likely struggle on sandy beaches. However, the build and flexibility ensure that it runs smoothly on other terrains. 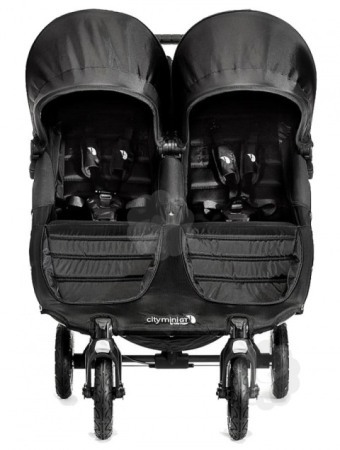 Perhaps, the most outstanding feature of the Joovy Scooter X2 Double Stroller is the storage baskets. These things are huge and will take in your diaper bag without the slightest difficulty. You also have additional spaces to keep your essentials and valuables. No need for an extra console. This stroller will pass through tight spaces and doorways seamlessly, all thanks to its flexible and sleek design. The width is just 30 inches. When it comes to storage and transport, a petite mum will probably struggle with the 32 lbs weight of this stroller. But here is a compensation – the 35.5 x 30 x 13 inches dimension means the stroller folds compactly and you wouldn’t need so much storage space indoors or in your car trunk. 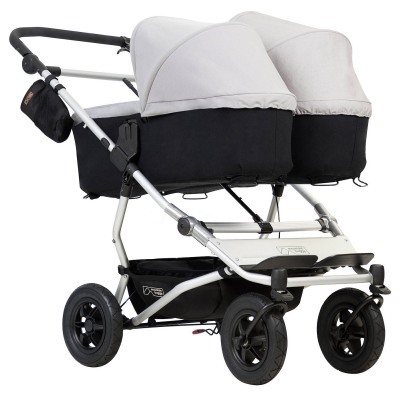 The Joovy Scooter X2 Double Stroller comes in five different colors, although with slight differences in price. Here is a note of warning – while the stroller is ideal for various terrains, moving on grass and sand terrains will probably be challenging. The same goes for muddy and snowy trails. Likewise, this is not a stroller you can use with your infant car seats. Thus, it is not ideal for newborns. However, 3-year-olds and older kids can use the Joovy Scooter X2 Double Stroller with no difficulties whatsoever. While it is always convenient and easy to buy online, ensure that you buy from only trusted outlets, as this may determine if you get excellent customer support or not. 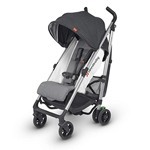 Amazon is a good place to shop for the Joovy Scooter X2 Double Stroller. Most potential buyers rely on verified reviews from past buyers of the same product in making a decision. The Joovy Scooter X2 Double Stroller has earned a lot of positive feedback from happy parents and having analyzed the same; we have identified the top strengths and weaknesses highlighted by the reviewers. The current market has witnessed a significant demand for the Baby Jogger City Mini Double Stroller. Baby Jogger has done quite remarkably to pack excellent features in this double stroller, to ensure 100% convenience for its users. The dual front wheel design is a notable feature, as well as the suspension system that offers additional stability and protection during bumpy and rough rides. If you are running on the normal road surfaces, you can rest assured of maximum mobility, all thanks to the swiveling front wheels. However, when you move to the rough aisles, just lock them in place and continue moving. With several reviews by parents confirming the ability of this stroller to move seamlessly on grassy terrains and cracked pavements, this stroller is ideal for all outdoor activities. The maximum weight limit of the Baby Jogger City Mini Double Stroller is 100 lbs. Both seats are generously padded for your kids’ comfort and can easily recline whenever you want to, especially when the little passengers fall asleep on the road. That is not all about comfort; there are separately adjustable backrests. When the summer comes, the vented top offers excellent airflow at all times to keep your babies cool. And if the temperatures drop significantly, the retractable weather shield comes really handy. Interestingly, the Baby Jogger City Mini Double Stroller can conveniently house 4-year-olds, considering its long backrests and very spacious seats. There is enough space between the seats, thus eliminating the possibilities of seat fights between the passengers. The canopies in the Baby Jogger City Mini Double Stroller are large and extendable, offering your kids 100% protection from the harsh summer weather. The canopies have two peek-a-boo windows (one to each), giving you easy access to your kids while on the go. You will most likely find foam covers in most strollers. 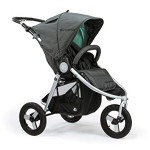 However, the Baby Jogger City Mini Double Stroller stands out with a rubberized ring fitted with the handlebar. However, the handlebar is not adjustable and may pose problems for parents that are too short or tall. The flexible design offers one-hand navigation, alongside easy maneuvering in tight and crowded places. Talking about the storage, this double stroller comes with storage baskets of different size, each placed under the seats. These baskets are large enough to contain medium-sized diaper bags. However, parents may face difficulties in accessing them due to the presence of a middle bar located at the back of these baskets. The side pockets are easily accessible and spacious enough to keep your small items. There are also two additional storage pockets behind the seat where you can keep your wallet and keys. 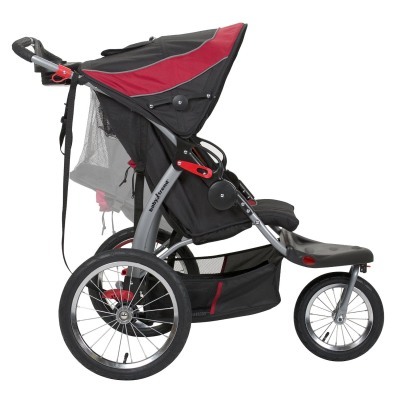 The Baby Jogger patented folding technology is integrated into this stroller. Thus, folding is quite seamless, and with folded dimensions of 31.89 x 30.12 x 9.48 inches, you don’t need too much space indoor or in your car trunk to keep this stroller. The width of the Baby Jogger City Mini Double Stroller is just 30”, making it one of the slimmest double strollers out there. The biggest advantage of the reduced width is the ease of maneuvering through tight passageways and doorways. With a total weight of 28.6lbs, lifting and transporting the Baby Jogger City Mini Double Stroller will never be a problem. Here is a note of warning: do not bank on the 8” foam rubber tires to thrive on all terrains. Yes, they are decent, but not ideal for long runs. The Baby Jogger City Mini Double Stroller can be budget-friendly, so far you are not getting the rather expensive color models. You can find out more about the pricing on the Amazon product page. If you are in the market for a stroller that handles both occasional adventures and everyday use perfectly, then the BOB Revolution Flex Duallie 2.0 Jogging Stroller is your best bet. This stroller is great for twins or infants with similar ages, with a design that allows a toddler and another kid in a car seat. 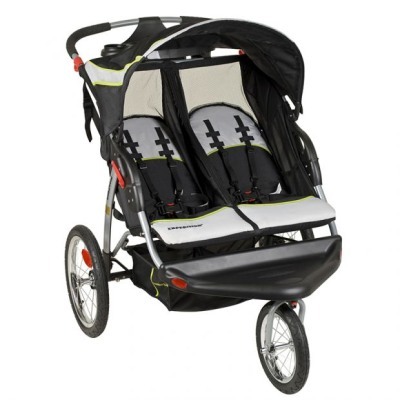 Maneuverability and navigation are quite seamless, considering that the double stroller is lightweight. However, the build is impressive with quality materials used all through. If you are used to facing challenges while trying to find your way through normal doorways, the BOB Revolution Flex Duallie 2.0 Jogging Stroller is about to change your experience for the better. It is slim enough to go through all passageways easily. In addition to the simple and flexible design, the manufacturers have also included ample storage space for you and your babies. Now you can pack as much as you want and still have a smooth stroll. The double side-by-side design allows your kids to sit beside each other. The recline for both seats is separate, and this comes handy when one of your passengers is a toddler and the other an infant because you can have one of them sitting up while the other takes a nap in the reclined seat. You can tilt back the two seats up to 70 degrees from the vertical. In the newest model, you can recline with a single hand, and alternatively, you can leave the seat almost entirely upright. The maximum weight for each set is 50 lbs and height of 12.5”, the manufacturers believe each seat should be able to handle 8-weeks old (only when combined with an infant car seat using an adapter). For a child that can sit up and control their head and neck on their own, the jogger seat is ideal. There are two five-position sun shade – one to each seat – and both can be adjusted separately. 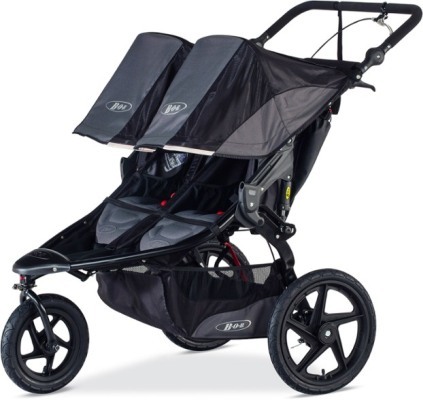 Like what you have in other BOB models, the canopies in the BOB Revolution Flex Duallie 2.0 Jogging Stroller also offer outstanding shade from the sun. With a separate peek-a-boo window to each canopy, you can keep tabs on each passenger at all times, irrespective of the recline angles. Keep in mind that the Velcro close on the plastic peek-a-boo windows can be noisy. When the seat is in a reclined position, you can easily check your babies via the extra mesh window placed on the top of each seat, and the same outlet serves as an extra inlet for quality air. 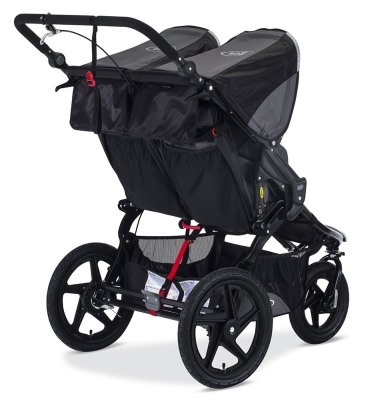 The wheels in the BOB Revolution Flex Duallie 2.0 Jogging Stroller are perhaps the most outstanding feature. These air-filled, high-impact polymer rear wheels are designed to thrive on all types of surfaces. You can either set the 12.5” front wheel to be fixed or pivoting, and you can remove them altogether to have more compactness that facilitates storage and transportation. If you ever need to refill the air in the tires, the normal bike pump will do a good job. The suspension system in the BOB Revolution Flex Duallie 2.0 Jogging Stroller is adjustable and comes with a two-position shock absorber. It ensures that your babies are not affected by the bouncing that comes with bumpy and harsh terrains. Thus, you can stroll on cracked sidewalks, rough roads, wooded and gravel pathways, or any other type of terrains. The spines of your little passengers are well protected with the soft and generously padded seats. The whole frame is lightweight but durable, and at 33.1 lbs, the stroller is definitely durable enough to handle two passengers conveniently. The maximum weight is 100 lbs, and you can stroll your older toddlers and preschoolers in the BOB Revolution Flex Duallie 2.0 Jogging Stroller, all thanks to its extra weight. With a width of 30.5”, this is not the tiniest stroller in the market, but it passes through most doorways and elevator doors easily. The stroller also sports a two-step folding system that makes transport and storage quite easier. For more compactness, simply remove the detachable wheels. This beast is available in multiple colors – Meadow, Lagoon, Canyon (orange), Red, and Black. However, you can only get some of these colors at specific retailers, and they may come at different prices. With several excellent feedback from parents, it is no doubt that the BOB Revolution Flex Duallie 2.0 Jogging Stroller has lived up to expectations. Even at that, there are still a couple of downsides identified by the current users. Users have mentioned the well-balanced structure of this stroller that allows you to conveniently keep two kids of varying weights and age in it. The one-hand steering facilitates a smooth ride at all times, and if you ever need to run, the heavyweight is never a hindrance. So, you can take this stroller for shopping. Other notable mentions include its durability and big storage space, as well as the impressive quality of materials used in its making. For parents that can afford the price of the Bumbleride Indie Twin Double Stroller, it is definitely a worthy buy. 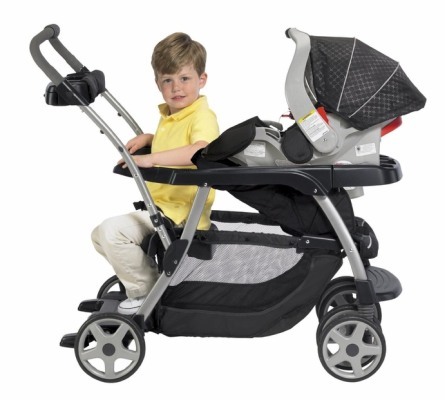 Here is a stroller that packs excellent features and impressive durability. You can use it for newborns, all thanks to the two bassinets and infant car seats included. The balance and stability are remarkable, and you can easily move it around with your little passengers onboard. You can recline the seats and set the calf rests to your preferred positions or the positions that suit your baby the highest level of comfort. However, the seats have adopted a front-facing design, thus keeping tabs on your little passenger’s recline on the go can be a bit challenging. If you are the type that embarks on outdoor trips frequently, then you should install a bassinet as a dependable fix. 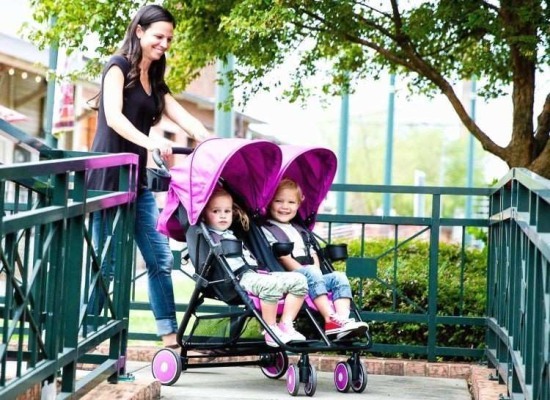 If you are buying the Bumbleride Indie Twin Double Stroller, there is no need for getting a stroller. It is safe to say you that the slightly higher price covers for the infant seat of the stroller. The maximum weight the Bumbleride Indie Twin Double Stroller can carry is lesser – 45 lbs, unlike the Baby Jogger City Mini GT Double Stroller that carries up to 50 lbs in each seat. According to the feedback from current users, the Bumbleride Indie Twin Double Stroller should serve you for three years or more. This stroller ensures your babies nap conveniently, with generous padding and cushioning of the seats. Are you worried about the harsh weather affecting your kids? You do not have to. The stroller packs two spacious canopies that offer proper shade protection for your kids at all times. The canopies are still very much effective against the sun even when the seats are on full recline. Each of these canopies has a mesh window, alongside a magnetic closure that replaces the traditional noisy Velcro closures. This ensures that your little passengers enjoy maximum ventilation without being disturbed by noise while on the go. Perhaps, what sets the Bumbleride Indie Twin Double Stroller apart from its peers is that it comes with two infant car seats. This is hardly seen in side-by-side double strollers. Furthermore, it is compatible with Nuna Pipa, Maxi-Cosi, and several other car seat models. Let’s take a look at the impressive wheel configuration included in this stroller. This ensures that the stroller stays 100% firm on every terrain while keeping the stroller from bouncing unnecessarily during rides on rough terrains. Your little passengers have their spines well covered, all thanks to the reliable wheel design that eliminates all the probable disturbances on all delicate body parts of your baby. If you ever have to ride on unfamiliar terrains, you can simply lock the front wheels. Otherwise, they swivel on their own to keep you going seamlessly. The 12” wheels are considerably large, and when combined with properly inflated tires, you can rest assured of a smooth ride at all times. You also enjoy extra stability courtesy of a buoyant suspension system. Now you can ride away on grassy, snowy, and even gravel terrains. 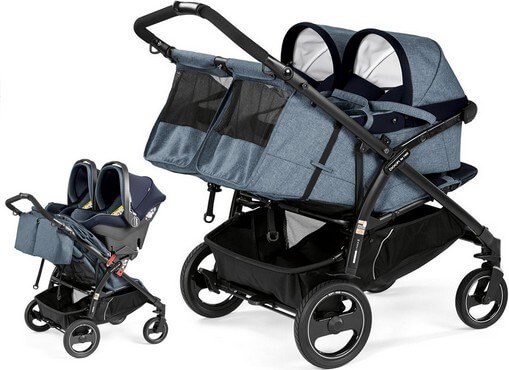 The Bumbleride Indie Twin Double Stroller weighs 36 lbs. 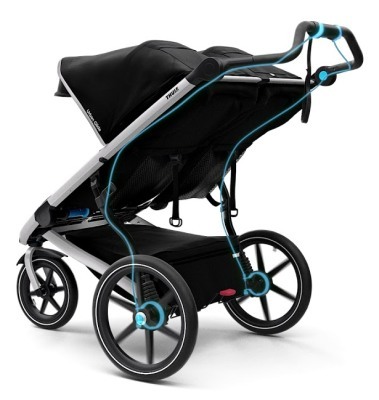 While this is not the lightest out there, you can expect minimum convenience while pushing the stroller around. The cargo basket packed in this stroller is arguably one of the biggest you will find around. It will easily contain all your outdoor items while allowing you easy access to them at all times and from all angles. In addition to the storage baskets, there are additional storage spaces, i.e., the mesh pockets, where you can keep your water bottles. 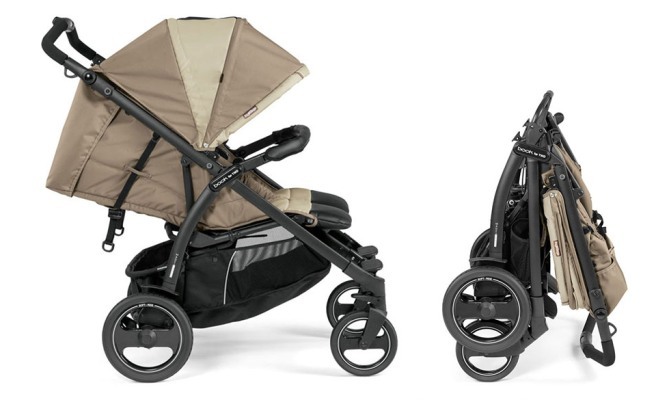 Folding is quite seamless in the Bumbleride Indie Twin Double Stroller. All you need to do is reach for the two triggers on the handlebar and lift them simultaneously. The stroller will fold forward, and that is all. When folded, you can activate the auto-lock feature or the self-stand system for easy storage. 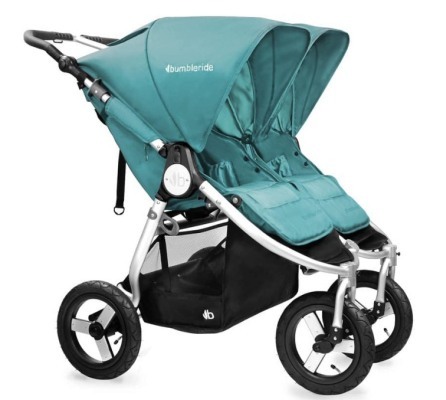 Similar to what is obtainable in most strollers in the market, the folded Bumbleride Indie Twin Double Stroller will still take a considerable amount of space, with a dimension of 32.5 x 29.5 x 13.5 inches. However, you can achieve slightly more compactness by removing the rear wheels. So, you may want to check that your car trunk has enough space to contain the Bumbleride Indie Twin Double Stroller before going ahead to buy it. Lastly, even though the Bumbleride Indie Twin Double Stroller sells slightly for a higher price, there are no out-of-the-box accessories. So, you should expect to buy a separate rain cover, if you need one, or car seat adapters, standing boards, or bassinets. 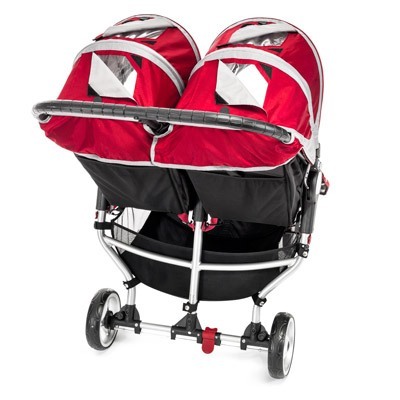 Most users are obviously not disappointed by the Bumbleride Indie Twin Double Stroller. Even at that, it is best that you check to ensure that it suits your needs before going ahead to make a purchase. Note that this stroller is a bit pricey, but it is a worthy buy for those that can afford it. You are guaranteed of a durable stroller that packs a lot of impressive features. 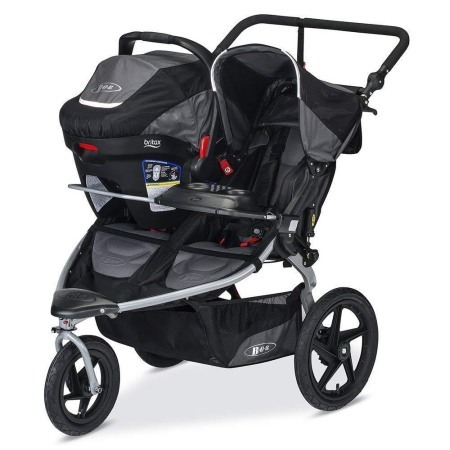 The price of the Baby Jogger City Select Double Stroller is a bit on the high side. However, when you consider the several features packed in it, you will agree that it is worth every penny. 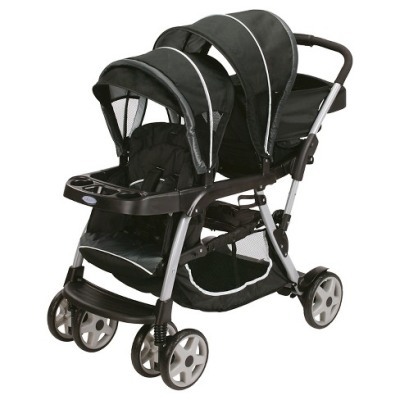 So, if you have the money and are willing to spend on quality and deserving double stroller, here is the right one. This stroller is unique, considering that it is both expandable and convertible. Thus, you can get it even if you have just one kid. The size remains the same, irrespective of which mode you have set it to. It is also suitable for twins and even newborns; you only have to combine it with one or two bassinets, infant seats, or toddlers’ seats. So, you definitely have several options to choose from. 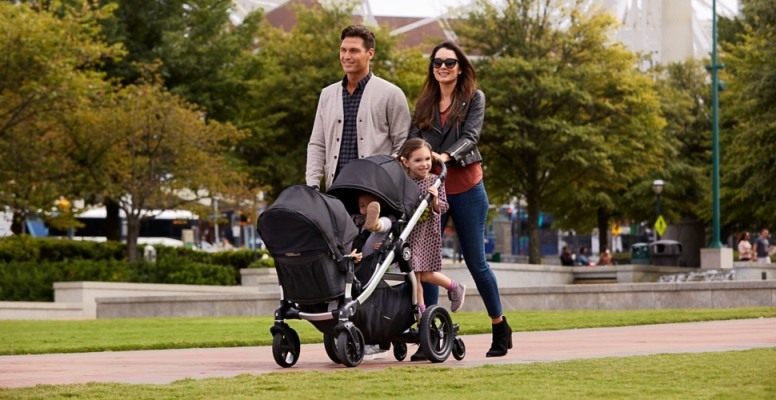 Unlike the traditional double strollers that have just two seats, usually for a certain age range and permanent, the Baby Jogger City Select Double Stroller allows you to 16 distinct seat combinations. Now that is a good value for your money! You can put your 6-months-old or older kids on the seats conveniently, so far they do not exceed 45 lbs each in weight. The seats can be reclined separately, up to four various positions. This, alongside the adjustable calf rest, guarantees your little passenger a comfortable stay all through the ride. The seats are reversible, thus allowing you to keep tabs on your babies in real time while on the go. You can even adjust the seats to face each other, thus allowing your babies to play all they want. If you are looking for separate and extensive canopies in a stroller, you will find it in the Baby Jogger City Select Double Stroller. The canopies are big and spacious, keeping your precious gems from every element of the weather. The adjustable heights of the canopies mean you can set them to suit each kid, in cases of differences in heights. The UV50+ protection fabric, coupled with the peek-a-boo window’s silent magnetic closure, puts you in the best position to watch over your kids during summer outings. Let’s talk about the handlebar – another excellent user-friendly feature. The handlebar can be adjusted easily to suit the height of almost all parents. 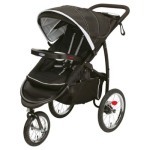 When it comes to folding, the Baby Jogger City Select Double Stroller does it in one piece. And when folded, it requires little storage space due to the extensive compactness. 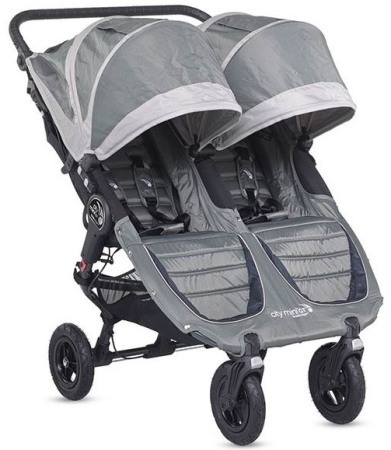 You will find the Baby Jogger City Select Double Stroller in multiple colors although the differences in colors may come at a slightly increased price. 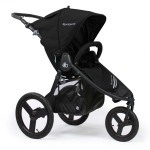 However, whichever you go for, you can rest assured of an appealing and feature-rich reliable stroller in the end. You should expect the stroller to be a bit heavier when the two seats are attached – at around 38lbs. There is no extensive space between the seats, so your kids may tend to disturb each other in certain instances. For more information on the colors available and the prices of each, check out the product page on Amazon. 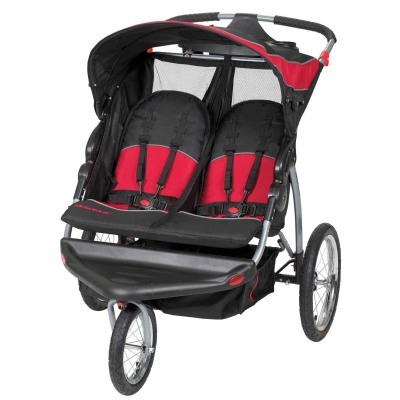 Here is another side-by-side double stroller that can also serve as a jogger as your kids grow. When compared to the BOB Revolution Flex Duallie, the Urban Glide 2 slightly edges it out on the premise of more quality and less bulky design, as well as lesser cost. 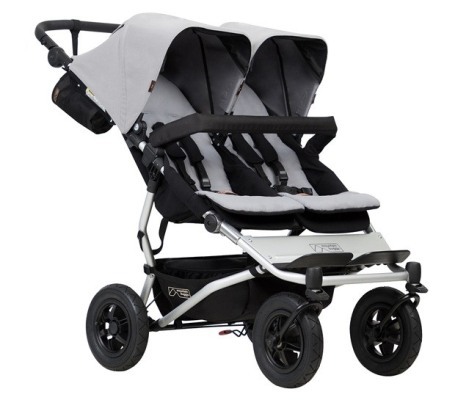 The two seats present in this stroller enjoy the same features and benefits. Maneuvering this beauty is quite easy, and when folded, it becomes quite small and compact. 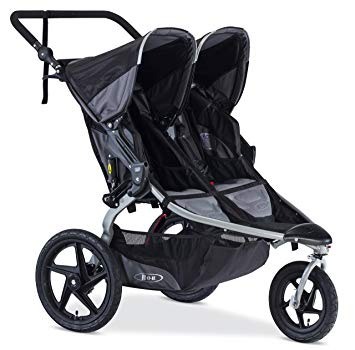 So, if you are in the market for a double stroller that is ideal for both jogging sessions and the everyday outings, here is a good option. It can easily serve two infants even after growing up a bit. 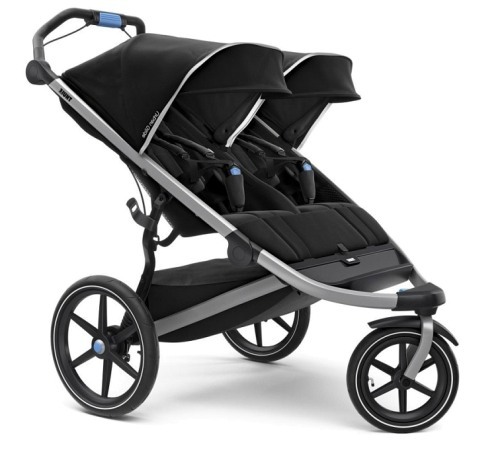 Just like the preceding model, the Thule Urban Glide 2 Double Stroller sports a three-wheel configuration along with a 16-inch rear and 12-inch front wheels. You will need to pump the tires regularly, considering that they are inflatable. The swiveling front wheel comes handy for seamless strolling on flat terrains, by offering smooth control. And if you ever want to switch to the very rough terrains or go on jogging, all you need to do is lock the front wheel to get the ideal stability and balance required for such strolls. Talking about the storage compartment, this stroller offers ample-spaced baskets that can easily contain very big diaper bags, so far they do not weigh more than 10pounds. However, if you ever had to fill the basket to the brim, zipping the weather-resistant cover can be challenging. More space? Check out the back pockets – they come handy for keeping smaller items. The back seat pockets are the place to keep your essentials, including cellphone, water bottle, keys among others. The back seat pockets can be a bit difficult to reach once the seats are reclined. For your babies’ snacks and cup, they can be kept in the storage pockets with proximity to their seats. 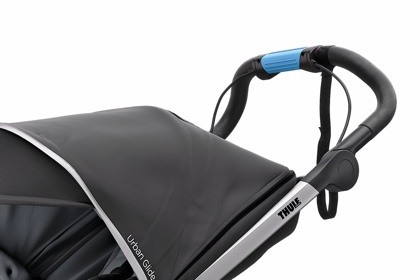 The canopies in the Thule Urban Glide 2 Double Stroller offers excellent coverage for your passengers, and are equipped with peek-a-boo style windows that allow you to monitor them on the move. 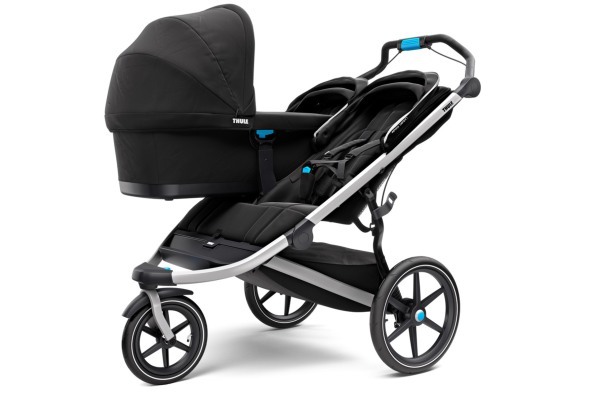 There is a twist hand brake in the upgraded model of the Thule Urban Glide 2 Double Stroller – a feature the previous version lacks. The handbrake helps in controlling the stroller better, especially when jogging or riding on very bumpy or steep areas. The two seats have a five-point harness each, along with a useful and more easy-to-use buckle. You can now adjust the straps of the harness easily, using the non-rethreaded adjustments. Although the length of the crotch strap is also adjustable, the position is always fixed. To ensure the maximum comfort of your little passengers, the Thule Urban Glide 2 Double Stroller has generously padded the seats, which according to the manufacturers, can contain up to 75 pounds each. The size remains the same, compared to the older versions, although a couple of users have condemned the insufficient width of the seats at 13.5 inches, especially for three-year-olds. However, the back and leg rest are ideal for kids that are four years old and below. More extensive space is also available to the passengers, all thanks to the canopy. 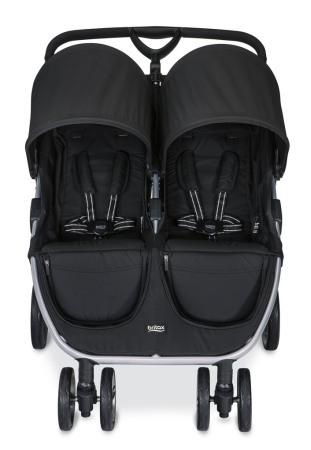 The previous model of this stroller has a very extensive canopy, and the same is retained in this latest model of the Thule Urban Glide 2 Double Stroller. You can expand it as much as you want, thus giving your babies 100% coverage from the harsh weather. The silent magnetic closure on the plastic peek-a-boo window ensures that there is no noise whatsoever when the closure is opened. Quality ventilation is assured, courtesy of the additional air coming in via the mesh side-windows of the canopy. The handlebar in the newest model can be adjusted – the same with the previous model. You can set it from 35.5 to 44 inches above the ground. Thus, every parent can easily push this stroller irrespective of their heights. You have twins or kids whose ages are not far apart? This stroller is ideal for them. 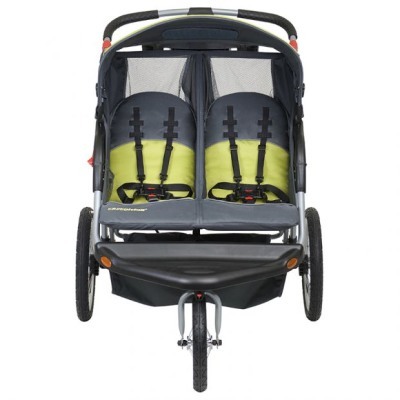 Also, if you are the type that engages in regular outdoor workouts, jogs, or running, as well as off-road walks, this stroller will allow you to keep your kids close while on the move. Wondering how it can do all of these? Well, it is due to the 1.2.5 and 16 inches front and rear polymer wheels, which are fixed with pneumatic tires capable of neutralizing all the shocks that come with riding on these very rough terrains. You will need to keep the tires filled with air regularly so that they continue to take in all the shocks. You can inflate them using the regular bike pump. Another reason the BOB Revolution Pro Duallie Jogging Stroller will thrive on all surfaces is the integrated suspension system. The suspension system offers excellent stability, and it is adjustable to suit the type of surface you are riding on. It offers dual positions for both heavier and lighter passengers and guarantees you a smooth ride on all types of terrain without getting your kids unsettled while on the move. In addition to the common parking break, which is usually operated by the foot, the BOB Revolution Pro Duallie Jogging Stroller comes with a handbrake that offers more control of how much speed you are moving at. This comes handy for parents that like running on hilly surfaces, as it guarantees adequate control of the stroller at all times. You will not find this in all strollers out there. The well-padded handlebar is another feature worthy of mention. Interestingly, you can set the handlebar in up to nine various height positions. This makes the BOB Revolution Pro Duallie Jogging Stroller ideal for every parent irrespective of their heights. So, if you are a short or a person too tall, there is nothing to worry about with this stroller. Your passengers are guaranteed of excellent comfort and support, all thanks to the generously-padded seats. With a weight limit of 50 lbs and a recline angle of 70-degrees vertical, these seats are great for relaxation on the go. You can recline the seats by pulling the straps at the back of the seats. Although the deep recline makes nap quiet easy and refreshing for your kids, ensure not to run with the stroller while the seats are in this position. Deep recline is only ideal for works. 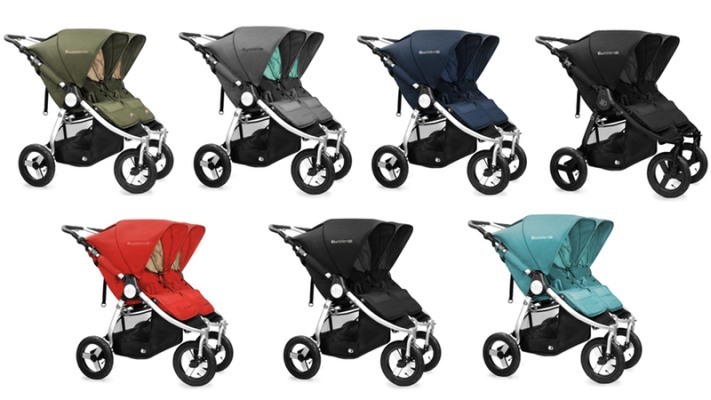 The sunshades in the BOB Revolution Pro Duallie Jogging Stroller are quite large and can be adjusted separately, allowing you to choose from one of five various positions. Each of these positions can offer your little gems a 125-degree coverage range. And if you are concerned about how to check on them while on the move, the sizable peek-a-boo window on each sunshade comes handy for this purpose. The only downside is the presence of a Velcro closure on the peek-a-boo window, which will most likely cause noise when in use. Talking about storage space, the BOB Revolution Pro Duallie Jogging Stroller comes with two large baskets with ample storage space. Each basket is under each seat, along with a back pocket each, which come handy in keeping essentials while on the move. You have four mesh pockets in total inside the seat. You can keep the toys and Sippy cups of your babies close in these pockets. 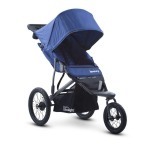 The BOB Revolution Pro Duallie Jogging Stroller is quite pricey. However, several parents still consider as a worthy choice. This is indicated by the high number of feedback it has gathered on Amazon. Most parents have commended its top-notch overall quality and convenient ride. The ease of push on all the tough terrains is also mentioned, all thanks to the suspension system. The two-brake system also helps parents to control the speed better, with the handbrake coming handy during rides on sloppy or hilly terrains. The compact size means it will pass through the usual doorways. While most parents have commended its sturdy build, there have been complaints about the feebleness of the sunshades. Likewise, the suspensions are reported to require readjustment almost now and then due to the absence of a proper lockout system. Perhaps, the most notable downside of this stroller as reported by users is the absence of accessories out-of-the-box, even though the stroller is considerably more expensive than its peers. You can only get the best out of a double stroller when it is fast, safe, and easy to use. It should also offer maximum comfort for your little passengers and must be able to handle almost all terrains. All these and more are what you get from the Mountain Buggy Duet V3. Let’s start from the slimness and narrow size of this double side-by-side stroller. With a width of 25.6”, the Mountain Buggy Duet V3 has a narrower wheelbase, compared to several single strollers in the market. Thus, it can easily fit through doorways and elevators and the tight corners and jam-packed side roads. There are four 10-inches wheels fitted with air-filled tires, thus absorbing all the shocks and bumps that come with riding on rough terrains easily. So, both you and your little passengers are guaranteed a comfortable ride all through the journey. The versatile wheels are ideal for both rougher surfaces and evenly flat terrains, including sandy, grassy, and gravel roads. 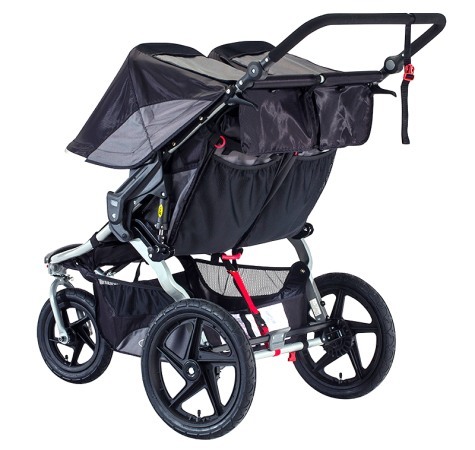 If you ever have to take it on more bumpy terrains, it is ideal to have the front wheel locked, as this offers additional stability to the stroller. Conversely, you would be better off with the swivel front wheels when on tight runs. The ease of pushing will get you thinking it is not a side-by-side double stroller, all thanks to the compactness and lightweight. There are a couple of seating options for your little passengers, and this is one stroller you can use from infanthood through toddlerhood all thanks to its regular seats and a couple of extra attachments. You can combine with a wide range of car seats, and if you so wish, you can use it as a travel system for a single or double little passenger. You can also combine this stroller with Carrycot plus especially if you are looking for a way to allow your newborn ride in a flat position. You can only attach the Carrycots after removing the regular seats. Carrycots can be purchased separately, and are available in various colors. While Carrycot is a good option, the use of bassinets is much better because they offer adequate support for the fragile backs of your newborns. Moving your baby from the car to the house and vice-versa will be more challenging, compared to what is obtainable when the stroller serves as a car seat frame. Carrycots are ideal for long walks and the car seat for quick outings. 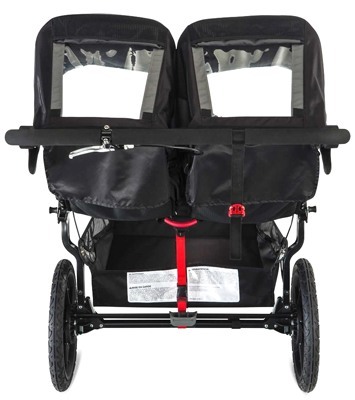 The Mountain Buggy Duet V3 packs two regular seats, positioned side-by-side. You can achieve a fully reclined position on each of the seat – an ideal position for younger babies. And in the case of older kids, you can also recline to a perfectly upright position. Another additional advantage is the separate adjustment of each seat – this allows each passenger to do different things at the same time without affecting each other. You also have a single-action parking brake that offers additional safety and convenience for you and the kids, especially when they are both heavy. The brake can be easily applied and release using your foot. We should also mention the presence of a five-point harness, along with an unlock buckle, in each of the seats. The buckle, placed at the middle of the harness, can be opened easily by the parents. 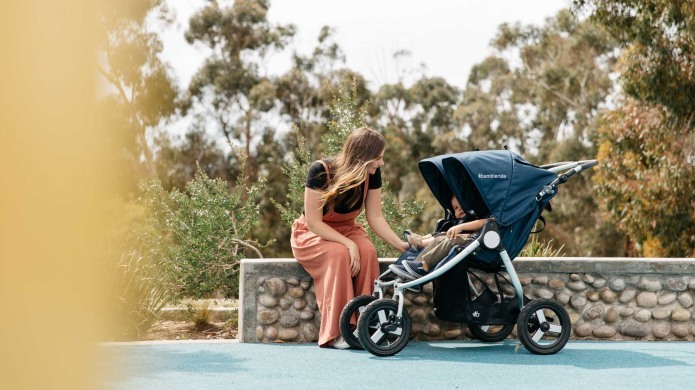 Your little gems deserve excellent protection, and this is why the manufacturers of the Mountain Buggy Duet V3 stroller has included a separate, extensive, and adjustable canopy for each seat. There is also a peek-a-boo window alongside a magnetic closure in each case. Also worthy of note is the SPF 50+ protection integrated into the flip out visors that is found in each of the canopies. All these contribute to the decent shade offered by the canopy. The Mountain Buggy Duet V3 stroller, although new, has earned multiple reviews from current users on the Amazon page. Most of these feedback identifies the size, comfortable seats, detachable padding, easy control, and effective handbrakes as the notable features that impressed many parents. The spacious seats are also mentioned, which can conveniently handle kids of 3 or 4 years of age. There are a couple of downsides also, notably the constant need to inflate the air-filled tires, the feeble soft foam cover of the handlebar, and the rather sturdy build. Below are some of the strengths and weaknesses of the Mountain Buggy Duet V3. 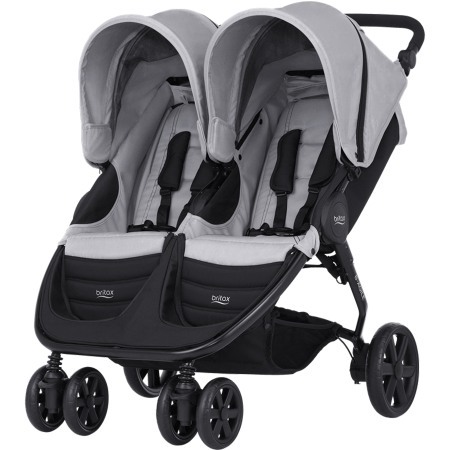 This luxurious double stroller was made with twins and children with similar ages in mind, especially newborns and children not older than three years. This Italian-made stroller packs a dual seat with a combined weight capacity of 90 pounds. Thus, it is ideal for taller babies also. Bigger children may, however, find the seats inconvenient, with just 12 inches separating both. You have a separate safety harness for each seat, and both are padded and adjustable. There is also a bumper bar in each seat, wrapped in faux leather and which offers additional protection for the seats. You can remove the durable bumper bar if you wish to. There is also an adjustable calf rest in either seat, as well as an infinite recline option, which you can activate from the back of the seat with a single hand. Activating this recline option is easier than putting it back up – the latter requires both hands. There is a fabric enclosure at the back of the seat, which when tucked in, shows some kind of an inlet that appears like a mesh window. This inlet offers additional ventilation. Your little passengers are not about to be harmed by the harsh weather elements. There is a big canopy for each seat, extending throughout the whole length and packed with three panels each. You can adjust each of these canopies separately to suit the condition of the weather. You can keep tabs on your kids through the plastic peek-a-boo window situated at the top of the canopy. Each of these windows has a magnetic cover that can be used to close the window when not in use. Accessing the peek-a-boo window can be a bit difficult, considering its location. However, it shouldn’t be a problem if you are tall enough. The handlebar is designed for ease of use, as indicated by the centrally-placed gripper and the generous foam covering. Thus, the Peg Perego Book for Two Baby Stroller can be operated with a single hand. Feel free to set the handlebar according to your height, in just a single push. Another feature worthy of mention is the fact that this stroller works fine with two Primo Viaggio 4-35 car seats. So if you have a twin, this is just what you need. You can combine the stroller and the car seats into a good travel system for both kids. However, you will need an adapter to effect the connection. Note that the adapter doesn’t come with the stroller out-of-the-box. Thus you will need to purchase it separately. Most parents would expect that the stroller should work with other car seats apart from the Per Perego products, and this may be a sort of downside. However, the Primo Viaggio 4-35 is one of the bests in the market and should be a worthy buy. Overall, Peg Perego Book for Two Baby Stroller is a good choice if you need a twin stroller that offers maximum value for your investment. With several features that offer maximum comfort for your little passengers, you will be glad you end up with the Peg Perego Book for Two Baby Stroller. The convenience associated with double strollers come at a price – you definitely need to pay more. Considering all the expenses that come with raising two kids, the ideal decision would be to save as much as possible on such items as strollers, while diverting the savings to other crucial aspects of child development, including education and healthcare among others. To help you save as much as possible on your next double stroller, we have come up with the list of the cheapest but reliable double strollers. Perhaps you think the drop in price will affect the performance of these strollers? You are wrong. The low price does not, in any way, takes away the qualities of these strollers, with several parents already using them and getting the maximum value for their investment. Now, let’s take a look at this list. The most striking feature of this stroller is the fact that it offers up to 12 different options. 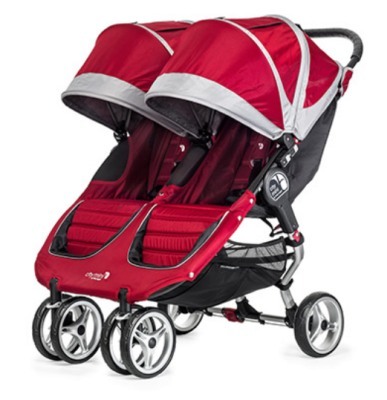 Now, this is one feat that is not common among double-strollers of similar price range in the current market. The Graco Ready2Grow Click Connect LX Stroller can be used with the two seats it comes with. Furthermore, it is compatible with one seat and one infant car seat, one rear, and one bench seats, a standing platform and a front seat, or the standing platform alongside the bench seat and many other combinations. Thus, you can expect this stroller to serve toddlers as well as newborns, or a toddler vs. a newborn. In simple words, it grows with your family. 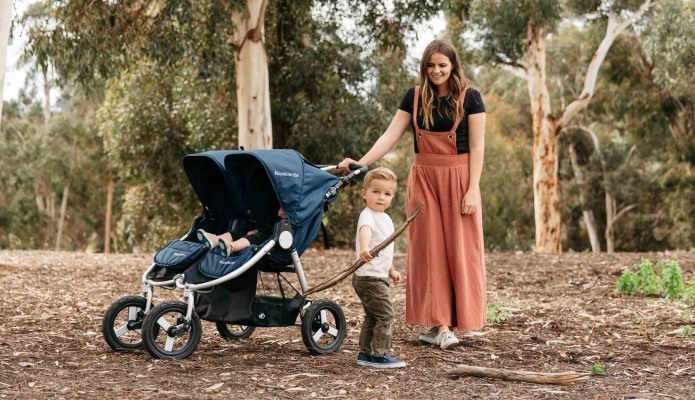 After the wildfire claims by some media outlets about the inadequacy of the brake designs of the Graco Ready2Grow Click Connect LX Stroller, the manufacturers have come out to debunk such claims. According to the company, the stroller’s design is such that ensures the safety of both the kids and the parents. Likewise, it stated that the braking system had undergone a significant upgrade in design to guarantee a 100% functionality even when on an incline. Both seats of this stroller sports a 5-point harness system, which is transformed into a 3-point harness system when the seats are detached to reach the bench seat or the standing platform. Thus, the two little passengers are well secured throughout the journey, irrespective of their positions on the seats. Both the standing platform and the front seat has a maximum carrying capacity of 50 pounds each, but the rear can only contain a child that is not heavier than 40 pounds. And in such case, the total carrying capacity of the stroller would be 90 pounds. Let us also talk about the excellent storage capacity of the Graco Ready2Grow Click Connect LX Stroller. Apart from being detachable, the child’s tray comes with cup holders, and can conveniently hold bottles while keeping it close to your toddler. The parent also has a rear storage tray where they can keep such items like a cup of coffee or a bottle of water. This eliminates the need for an additional backpack while on an outing with your stroller. Your little passengers are well protected by the extensive shade canopies, one to each seat. Although this adds to the bulkiness and extended width of the stroller, it doesn’t affect the ease of folding or transport adversely. In fact, you can fold the Graco Ready2Grow Click Connect LX Stroller with one hand and secure it with an automatic lock. Now, you can worry less about getting this stroller transported. You and your kids are guaranteed of a comfortable ride all thanks to the swiveling front wheels and the effective suspension system. Both contribute to seamless maneuvering while allowing you to push with little or no effort, even when you are on a very tough surface. The two seats, along with the cushions, found in this stroller are detachable and washable. You can clean the frame of the stroller by wiping it with warm water and soap. You do not need any special equipment or technical knowledge to assemble the Graco Ready2Grow Click Connect LX Stroller. You will be done in 10 to 15 minutes once you follow the simple instructions contained in the guide. Here are the strength and weakness of the Graco Ready2Grow Click Connect LX Stroller. Here is one versatile double stroller that is ideal for parents who like jogging but cannot afford to leave their kids behind. With the Baby Trend Expedition Double Jogger, you can now take your kids with you with assurances of comfort and convenience. This double stroller comes with a lot of impressive features for both the little passengers and the parent. For best results, only get this stroller if you have twins or kids of similar ages. Let’s start from the easy maneuverability of this stroller. 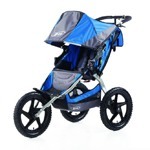 You have no problem whatsoever in pushing this stroller even in tight corners and tougher terrains. So, you can take it anywhere you want to go. Your kids can rest assured of a safe and comfortable ride all through, all thanks to the lockable front swivel wheel, which keeps the stroller light but stable while gliding effortlessly on the surface. The 16” wheels also come with a suspension system. This, alongside the special pneumatic air-filled bicycle tires, ensures that you have a smooth ride irrespective of how bumpy the trail is, whether you are on a casual outing or out there jogging around the neighborhood. The two children can conveniently seat on each seat, both of which offers 100% comfort and safety at all times. The Baby Trend Expedition Double Jogger comes with well-padded seats that make kids look forward to their session in the stroller. There is also a 5-point harness system that offers additional safety of the kids while in their seats, especially during a bumpy ride. While the kids can move freely in these seats, you can rest assured that the harness will keep them secured all through no matter how hard they try to get out. Both seats recline individually, thus allowing both kids to sleep at the same time on the go. Whether sleeping or not, they are well-covered from the sun by a sun-canopy. Considering the long list of essentials you must bring with you on outings with your kids; the Baby Trend Expedition Double Jogger has got you covered with a spacious storage basket that can hold almost all these items, including a diaper bag, water bottles, and wipes among others. Now, you can bring all you want for the adventure. Right under the seats, there is a large storage unit, which is the primary storage option of the stroller. The storage unit is so spacious that you can have your diaper bag in it, while still having enough space for other items. 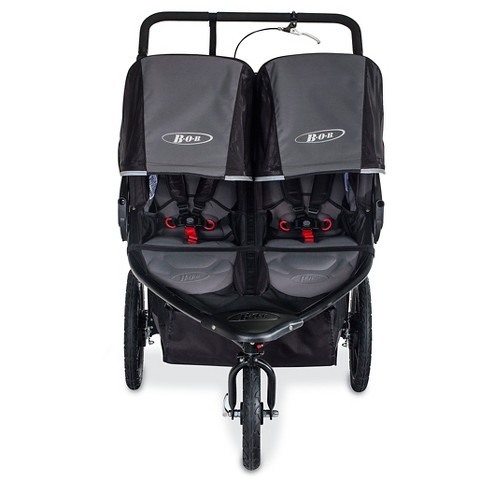 With Baby Trend Expedition Double Jogger, you do not have to leave anything out. 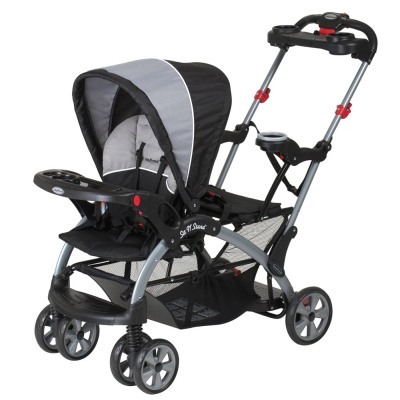 The amazing features present in the Baby Trend Expedition Double Jogger makes it a worthy investment. You will hardly find a stroller within the same price range with so much versatility. Even with the low price, the stroller still offers excellent durability and quality. It is indeed a worthy investment. There are many reasons to get a double stroller, most notably, the presence of twin babies or the expectation of a second baby. Having decided to buy a double stroller, the next step is finding the one that is best for your family. This can be a tricky task, considering the unlimited options of double stroller available in the market currently. Thus, we have created this buying guide to help you make the best choice of stroller among the lot. The model and type of the stroller you end up with will depend on your preferences, needs, and perhaps, budget. Another important factor is the ages of your kids – the ideal stroller for twin children is different from when you are expecting a second child to join a 3-year-old. While there are many factors to look at, here is the best way to go about assessing your needs and preferences to choose the best stroller for your two kids. What is the age difference between your kids? For kids whose age difference is just a year or less, a sit-and-stand double stroller is not an option. Most umbrella strollers are also not suitable for such scenarios, considering that they are not built to house two kids of different sizes. You should also note that only a couple of double strollers are compatible with a newborn and a big sibling for an extended period. So, always check that the weight limit of your potential double stroller is right for the combination of your twosome. For example, a good choice would be a double stroller with a combined carrying capacity of 100 pounds. You shouldn’t get a sit-and-stand stroller for twins. Instead, find suitable joggers, umbrella stroller, side-by-side strollers, and tandems – they are all compatible with children of the same ages. What is your propose usage style? 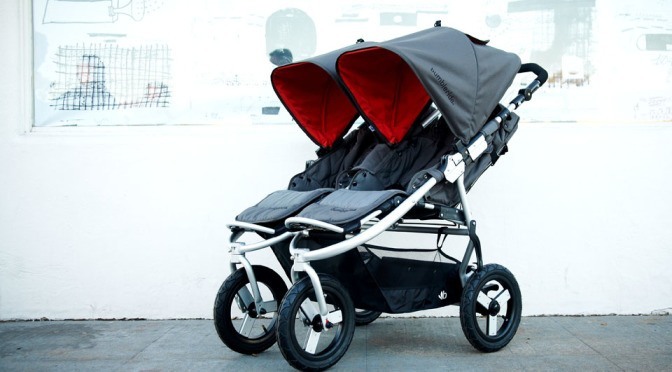 If your stroller would be moved in and out of your car repeatedly, you would want to avoid an all-terrain double stroller, considering their heavy and bulky nature. Conversely, if you are planning to stroll with your kids around the area, these well-built and easily controlled strollers would be the best for you. A double umbrella stroller comes handy if you are interested in a model that can pass as a travel stroller. How much are you willing to spend on your new acquisition? Keep in mind that the all-terrain strollers are ideally more expensive than their umbrella counterparts, although the latter hardly stands the test of time. If you have an older kid that can stand when on the go, and your budget isn’t a problem, you should consider getting a buggy board to attach to your current stroller. In this position, your older child (in the stroller) will come between you and the infant. In this arrangement, you have the two kids sitting next to each other. This allows easy movement, especially in tight corners. Likewise, the stroller will require little storage space. With both kids sitting side by side, the fight on who sits at the front or back never comes up. However, the downside is that your stroller will be too wide to pass through narrow doors and passageways. In this arrangement, there is one child at the front, and the other at the back. 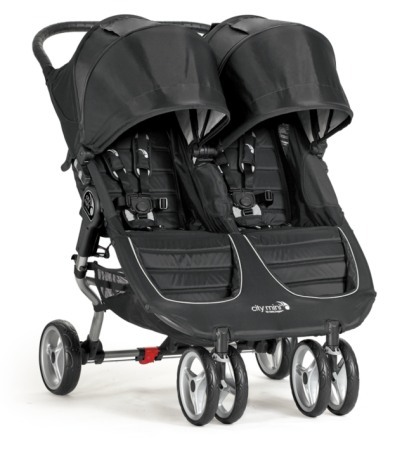 A couple of tandem or inline strollers have frames that makes it possible to attach two infant car seats easily. The advantage of this arrangement is the reduced width that allows you to push your stroller through narrow doors and passageways. Also, models with snap-in car seats ensure easy movement of your kids from the stroller to the car and vice versa. However, there are few downsides to this arrangement. The first is the difficulty in maneuvering, especially in tight corners. Also, the stroller is more difficult to be stored in smaller trunks. There are chances that your kids will end up fighting over who sits behind who, considering that the passenger at the back has a small seat and cannot see the surrounding. Your kids will most likely outgrow these strollers if they are compatible with infant car seats. 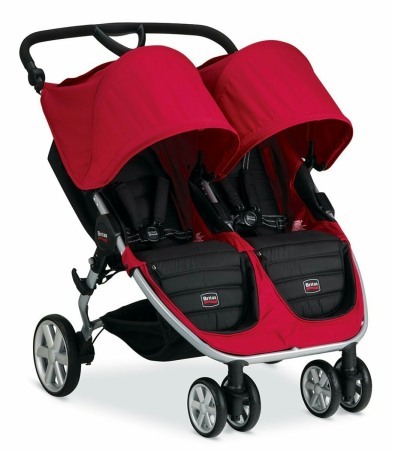 These models of double strollers are known for their ruggedness. So, if you are looking for a stroller that you can with you on trips to bumpy and rough surfaces, these models come really handy. They are easy to control and quite stable, although they are expensive. These models cannot hold as much punishment as their all-terrain components. However, it is less bulky, and thus, most parents find it a better option. 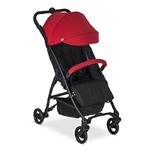 They come with ample storage spaces and impressive durability, compared to umbrella strollers. If you have ever wondered how you can take your kids along for runs, this is your answer. The three-wheeled style of these strollers ensures that they are easy to maneuver while offering a seamless ride. Keep in mind that the options are slightly limited when it comes to joggers, and they can be expensive. With these models, you can easily change from a single stroller to a double stroller or a double stroller to a sit-and-stand stroller. It all depends on the size and age of your passengers. Keep in mind that this versatility comes with extra weight and cumbersomeness. If you are the type that hardly uses a stroller, then these types of the stroller are great for you. They are quite light and folds easily, thus requiring little storage space and can be transported easily. However, this is not a stroller that can withstand the stress of everyday use. It is suitable for a newborn and kids with light weights. In a sit-and-stand stroller, only one of your two passengers gets to sit. The other stands on a board, which is usually situated at the back, while relying on a handle for support. You shouldn’t really consider this except one of your two kids is a preschooler who has no problem with standing while on the go or a toddler that detests sitting in a stroller. The biggest advantage of this arrangement is the ease of entry and exit of your older kid. Also, you only have to worry about buckling the younger kid, and the easy maneuverability saves you from considerable stress. However, you can only think about a sit-and-stand if one of your kids has grown to the stage of standing during the ride. If your older kid is too young to stand, you should consider a convertible stroller (from tandem to sit-and-stand), especially if you are seeking an option that can be used for long. 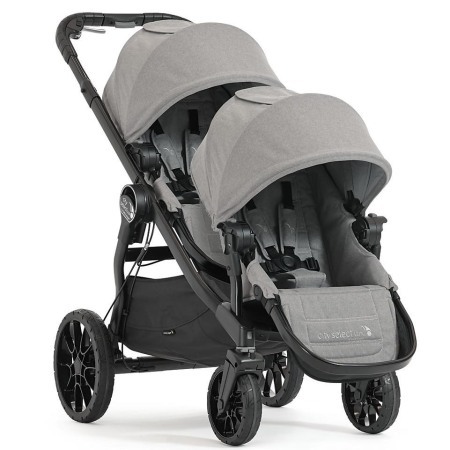 The basic features of most strollers in this review may appear to be the same at first glance. However, if you look more deeply, you will see distinct variations, especially in their features and how they perform. Without a proper test or a physical comparison, the similarity in features will most likely make it difficult to differentiate between most of these strollers. You should also keep in mind that an expensive price doesn’t necessarily mean better performance. For example, most of the outstanding models mentioned in this review are still reasonably priced. This means that you can still get excellent products without breaking the bank. While on the search, ensure that you stay true to your demands, rather than being swayed by the appearance or the great features you see in most of these products. There is no point buying a stroller that will not serve your needs, even if they are the most beautiful. Settle for a choice that perfectly meets your requirements, with the knowledge that every unwanted feature comes at an extra price. Most of the highly-rated products in this review all pack impressive features that offer convenience for both the riders and the parents. Thus, the chances of ending up with the wrong product (according to your requirements) are very slim. If you are going for an award-winning stroller on this list, chances are they offer excellent features that will ultimately make them a worthy buy now and always, irrespective of your requirements.